July 17  Dear Sir: Just a line to correct my address again. I've moved to another Naval air base here in Rhode Island, we handle Hellcats here also. It is good to read in 'Scuttlebutt' of the different fellows getting home, some for good. I hope it can become a mass movement by the end of the year, at least the navy has been right in the Nips front yard the last day or two and that sounds pretty good. Thanks for keeping the fellows from home more or less in touch with each other. 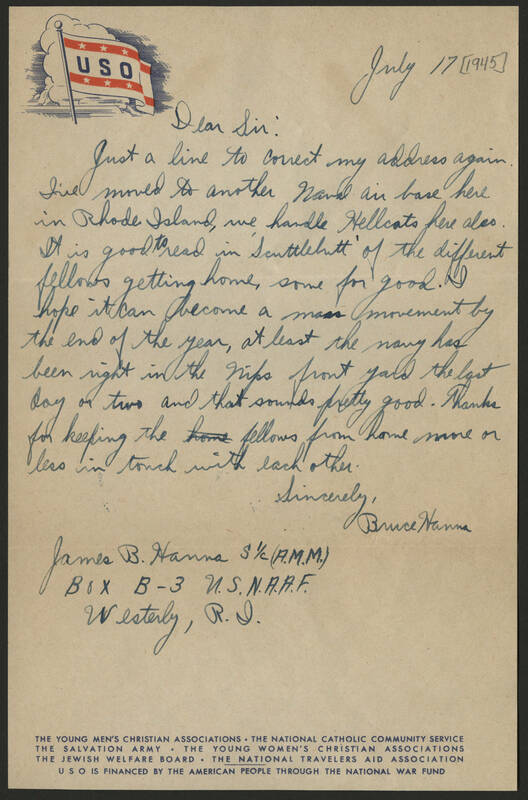 Sincerely, Bruce Hanna James B. Hanna S 1/c (A.M.M) BOX B-3 U.S. N.A.A.F. Westerly, R.I.